“Mad Days of Me: Escaping Barcelona” by Henry Martin is a difficult and an emotional read but one well worth your time. The main character Rudy is down and out in Barcelona after he has been robbed and raped. Without passport and money and unwilling to ask his parents to rescue him he gets stuck with homeless people, backpackers and the seedy world of drugs and crime. The writing is superb, reminiscent at its best of Henry Miller and Charles Bukowski with their raw emotions and heartfelt honesty. The dark tone, the anger and the bitterness of Rudy feels towards life, his parents and all other people of authority however were something I had to get used to, at times I found it challenging and uncomfortable but at closer analysis I understood that given the life circumstances of Rudy he has little option but to feel that he is a victim. Once he has hit rock bottom there is no one to help him. Like so many people, I did not want to be reminded of the existence of so many whose harsh everyday reality is just like that of Rudy. It is a raw and uncomfortable read at certain moments but a great and thought provoking one. The story is not all doom and gloom however and not without flirtations, suspense, action and hope. As Rudy stays in Barcelona he also grows up and overcomes some of his personal issues. This is a story of a backpacking holiday gone wrong, about growing up, about chance and choice, it is about the thin dividing line between fine and not so fine and the little time it takes to cross from one of those states to the other, it is about personal freedom and many other issues which I invite you to check out for yourself. This may not be an easy read for everyone but I recommend you pick it up and try. It was a book that stayed with me for a long time after I had finished it and Rudy is a character that still is in my head. I look forward to learning where he goes from here. First, let me express my heartfelt thanks for allowing me to talk about my work. Independent authors are mostly overlooked by the main stream media and, with so many books published each year, we often look at non-traditional venues to bring attention to our work. So thank you for all the time and effort you put into promoting the lesser-known novels. I came to writing by being a voracious reader from an early age. As a kid, I devoured every new, age appropriate book at a local library, and later moved on to a more serious literature dealing with, what I like to call, the human condition. It was only natural to start writing. I wrote a lot during my teenage years, but those pieces are, fortunately, lost forever. What was your connection to Barcelona and the issues your main character Rudy experiences? There is no personal connection to Barcelona or Rudy that I can think of, except that, like Rudy, I occasionally get on my soapbox. Actually, when I first started writing the book, I was considering Nice as a background for the settings of the novel. But Barcelona won. I did pass through Barcelona a few times while I lived in Spain, and it had the right mixture of seedy and eclectic that fit well with the story. This may no longer be true, as it’s been about twenty years since my last visit there, but at that time there were homeless people everywhere, mingling with the tourists, prostitutes, artists, all amidst great architecture and culture. The city had it all. The book began its life as a short story I wrote at work. It was only two or three pages, starting with a nameless character checking out from a hotel and walking to a subway stop, and ended with him in the bushes following his assault. Then the idea kept bugging me…it was unfinished. I took that short story and turned it into the Mad Days of Me trilogy. Are you planning any more books featuring the same protagonist? Yes. As I mentioned, Mad Days of Me turned into a trilogy. There are two more books coming out this year, Finding Eivissa and Eluding Reality. Both of these follow Rudy as he progresses through life. I wanted to separate the story into three books because each one focuses on a different period in his life. After Barcelona, Rudy grew from what we know of him into a more mature person, showing his vulnerable side. Unlike some reviewers, I never viewed him as a victim, and while he experienced some life-altering events in Barcelona, he was able to move on, establish a relationship, and see a glimpse of hope in his future. In the third and final book, Rudy faces reality with its many faces, his past, the lies he invented in order to survive, the hopes that are slipping away from him. How did you come up with the protagonist? Rudy is a reflection of society, a piece in the great puzzle called humanity. He is the great “What if?”, the person who comes a little too close to the edge and slips. I view Rudy as the stain on everyone’s consciousness – there are Rudys everywhere – the homeless guy at a subway stop, the beggar near the office building, that skinny young kid with a rat in his hand who hangs around the same square every day. We walked past them and, for the most part, don’t even see them. My idea was to explore the ‘why?’ behind these characters, instead of the ‘who?’. To this end, I intentionally did not go into too much detail when it comes to Rudy. What I mean is, the reader doesn’t know the color of his skin, his nationality, his ethnicity, his education… By stripping Rudy of these characteristics, the reader is left with a human being, his faults and qualities, but without any preconceived notions, the reader might have if he or she knew more about him. This way, I believe the reader can relate to the character on an unbiased plane, judging him only by his actions. The first draft took me about six months. I thought I had a masterpiece on my hands. When I actually sat down to read it (I dislike reading my own writing because I know what comes next) I realised I had a pile of sentences that needed a lot of work. My research falls into two categories: Characters and settings. For characters, I mostly observe what I see around me, perhaps research certain medical conditions, behaviours, et cetera. For settings, once I know where a certain work takes place, I research the demographic data, history, and use Google Earth to walk the streets from above. I want to see what the character sees: buildings, details, and landscape. If there is a particular place within a city where a story takes place, I try to search for detailed images as well. How comfortable do you feel writing about the crime scene in Barcelona? I wasn’t really writing about Barcelona’s crime scene, it was more of a street scene. I mean, Rudy finds himself amidst some seedy characters, but they are not really criminals; they are derelicts who turn to low crime when opportunity allows them to do so. Barcelona is fairly well know for pickpockets, drug dealers, and prostitutes. It’s a port city abuzz with tourists; much like any other metropolis where many different cultures meet. Why…Should I be afraid? Most of my writing is done between 10 o’clock at night and whenever I’m too exhausted to continue. My writing desk has a laptop, a coffee, some scrap paper and different pens, and a corkboard where I keep printed maps and various details relevant to the plot. That’s a tough question, because no matter how many times I look at it, I will always find something that needs fixing. A friend told me once that no matter how much I try, it will never be perfect, and it will never please everyone. I think there were two or three major edits in the beginning, at which point the novel was published by a small Canadian press. When the press closed its doors and I got my rights back, I did one major rewrite, expanding the novel by about 50 percent. My editors are mostly friends who love reading. 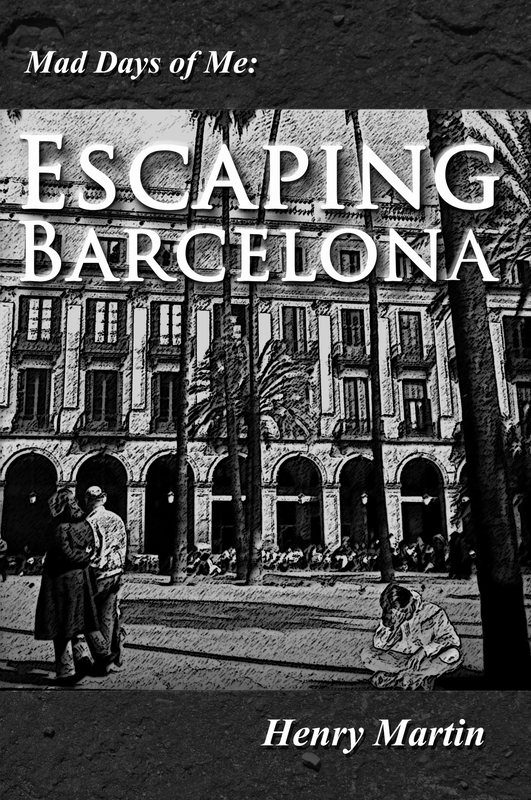 When I was rewriting Escaping Barcelona, I was fortunate to have the attentive eye of a fellow author who constantly challenged me on my writing. As far as quality control is concerned, I try to have anywhere between 20-25 readers look for errors and inconsistencies before I even consider a release. My writing has mostly been influenced by Miller, Bukowski, and Cossery. Another tough one, because I don’t really keep up with movies these days. I could see Leonardo DiCaprio if he still looked like he did in Basketball Diaries (I’m dating myself here). I do know, however, whom I would love to have as a director – Pedro Almodovar. He is the only director I can think of who would capture the raw emotions on film.